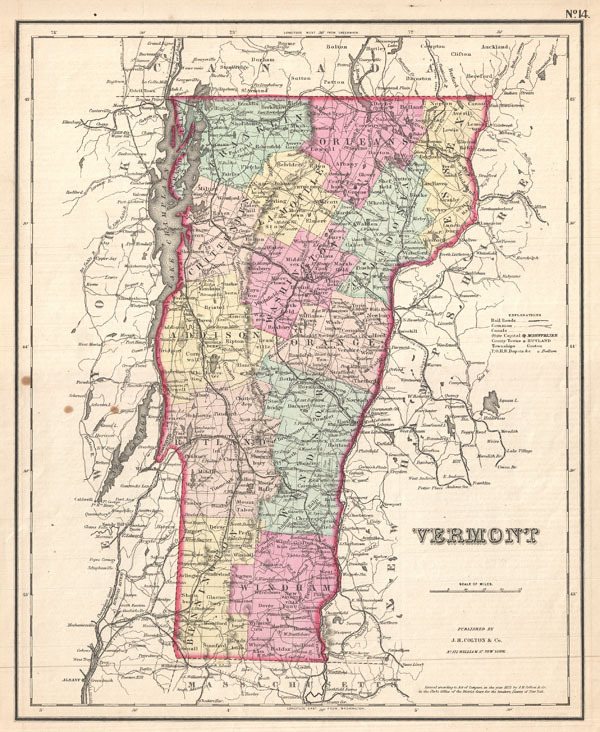 This is the uncommon 1857 issue of J. H. Colton's map of Vermont. Covers the state in its entirety, including Lake Champlain to the west. Divided and color coded according to county. Shows major roadways and railroads as well as geological features such as lakes and rivers. Like most Colton maps this map is dated 1855, but most likely was issued in the 1857 issue of Colton's Atlas. This was the only issue of Colton's Atlas that appeared without his trademark grillwork border. Dated and copyrighted: 'Entered according to the Act of Congress in the Year of 1855 by J. H. Colton & Co. in the Clerk's Office of the District Court of the United States for the Southern District of New York.' Published from Colton's 172 William Street Office in New York City, NY.